On 18 June 1815, Napoleon was defeated once and for all at the battle of Waterloo. The French royal family could now return home again. But although the King, Louis XVIII, requested his niece Marie Therese to be at his side when he entered France on 8 July, she didn’t return until the 27th. And when she did, she did it without pomp nor ceremony, and with a deep disgust for the cowardly way her uncle had fled the country without even trying to put up a fight against Napoleon. Marie Therese now decided that she wanted to have a say in the governing of France. She went on a tour of the country to consolidate her support, helped his uncle decide what ministers to appoint to his court, took charge of protocol and ordered the removal of all the bees, eagles, Ns, and other symbols Napoleon had had plastered all over the royal palaces. Marie Therese now refused to have anything to do with any Bonapartist and even convinced her uncle to banish the Orleans branch of the family, who had never been too supportive of his return to power, from French soil (although the ban wouldn’t last for long). There was another matter to settle: the succession. 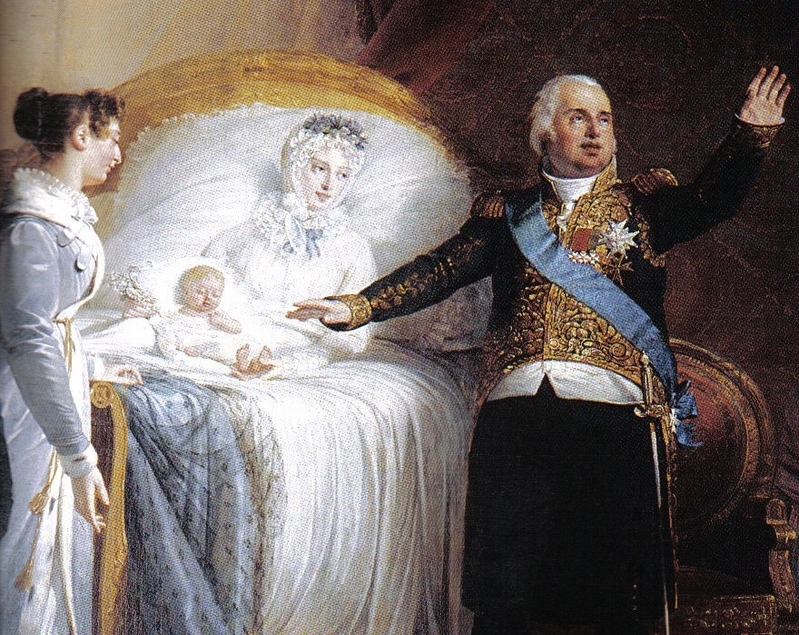 Louis XVIII was getting older and his marriage hadn’t produced any children. That of his niece and nephew, Marie Therese and the Duc D’Angouleme, was childless too. Thus, it was decided that the Duc D’Angouleme’s brother, the Duc De Berry should get married as soon as possible, but to whom? The choice fell on the 17 year old Princess Marie Caroline of Naples, the granddaughter of Maria Carolina of the Two Sicilies, Marie Antoinette’s favourite sister. 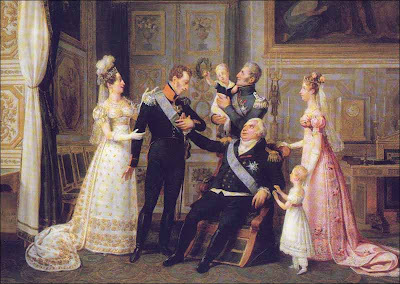 The couple married on 17 June 1816. The Duc de Berry was instantly smitten with his bride, but Marie Therese wasn’t too impressed. She considered her frivolous, silly and poorly educated. However, she softened somewhat when Marie Caroline became pregnant. Her first daughter and her first son, born about a year apart, both lived only for a few short hours. But in 1819, she finally gave birth to a healthy baby girl called Louise. She was pregnant with a son, Henri, when her husband was stubbed to death by a fanatical Bonapartist outside the Opera on 13 February 1820. Marie Therese and her uncle, the Duc D’Artois, blamed the King’s minister, Decazes and his liberal policies for the murder. Marie Therese threatened to leave Paris if he didn’t dismiss him. The relationship between uncle and niece hadn’t been good lately. Marie Therese was a fervent royalist and absolute monarchist, while the King was more pragmatic and realised the French people didn’t want to go back to the old ruling system. He was also jealous of her popularity, fearing she could threaten his position. And so in the end, he relented and got rid of Decazes. The following year, Marie Therese purchased the estate of Villeneuve-l’Etang, in Marnes, near Paris. It was a place where she could be with only a few close friends and where her nephew and niece could play and have fun. Maria Carolina loved to travel, party and generally have fun and so her children were often left with Marie Therese who was like a second mother to them. She supervised their education, appointed their tutors and instilled in them the belief in the divine right of kings. 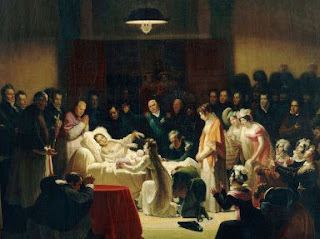 In the spring of 1824, Louis XVIII’s health began to deteriorate and it was clear he would never recover. Marie Therese ran at his side and wouldn’t leave it until his death. She was there when he died on 14 September. The Duc D’Artois was now King and Marie Therese Dauphine. At first, the King Charles X, who swore loyalty to the Constitutional Charter, was very much loved by his people. However, he was a fervent royalist, just like his niece and, in the spring of 1829, he began to make reactionary decisions that caused unrest in the country. On 26 July he made the disastrous decision to repel the Constitutional Charter. Paris was in turmoil again. Marie Therese, who was in Macon at the time, upon hearing this news remarked “It is the worst pity that I was not in Paris.” She knew the end of her uncle’s rule was near and hastened back to his side. The King was forced to abdicate. Both he and his son, the Duc D’Angouleme, signed a document relinquishing their rights to the throne in favour of little Henri. Some historians argue that for 20 minutes, the time that passed between the two signatures, Marie Therese had been Queen of France. But little Henri would never become King. The family had to hastily leave France after the abdication. Before doing so, Charles X had asked his cousin, the Duc D’Orleans to read the declaration of his abdication before the Chamber of Deputies. The Duc did so but omitted the part that named Henri as successor and was thus elected King himself. Charles, who had been the one to insist on a reconciliation between the two branches of the family, was shocked at his cousin behaviour. Marie Therese instead wasn’t surprised at all. She had always distrusted the d’Orleans family. On 16 August, Marie Therese and the rest of her party embarked on a ship that would take them to Great Britain. She would never see France again.